A former CIA contractor convicted of mistreating a detainee in Afghanistan who later died has been jailed for eight years and four months. David Passaro, 40, the first US civilian to be charged with abusing a prisoner since the Iraq and Afghanistan wars began, was convicted last August. 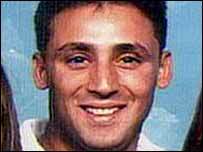 Afghan prisoner Abdul Wali was beaten in June 2003 and died two days later. Mr Wali, an Afghan farmer, had gone to the US authorities voluntarily to clear his name over a rocket attack. US District Court Judge Terrence Boyle, sitting in Raleigh, North Carolina, said that a lack of an autopsy kept Mr Passaro from being charged with murder. Said Akbar, the local Afghan governor who encouraged Mr Wali to go to the authorities to clear his name, wrote to the judge to say the incident had helped to recruit more terrorists. Mr Passaro, who was convicted of felony assault, said: "He is a human being. I failed him. If I could go back and change things, it would have never happened. I wish I had never gone in to talk to him."